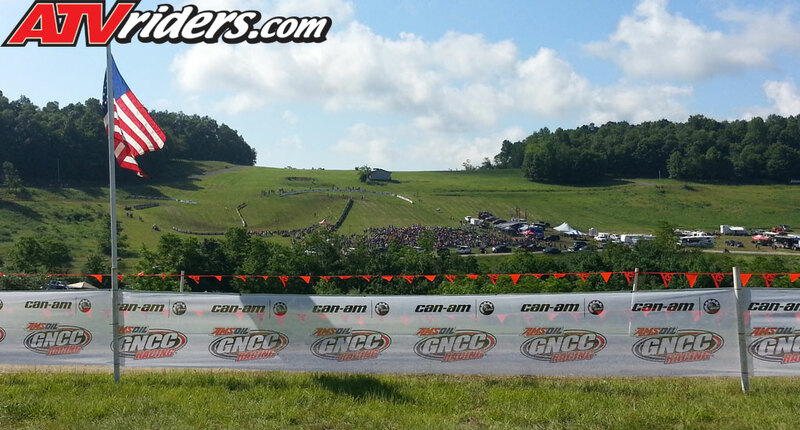 Saturday we woke up and watched the morning race start.There were rows and rows of ATV’s like nothing I had ever seen in person. Each class gets their own separate start, by the time the last class left the line I think the first class was already close to lapping them. The results sheet shows every class had at least 10 riders and some had over 30 or 40. That is amazing to me because ATV racing in the west has really slowed down. 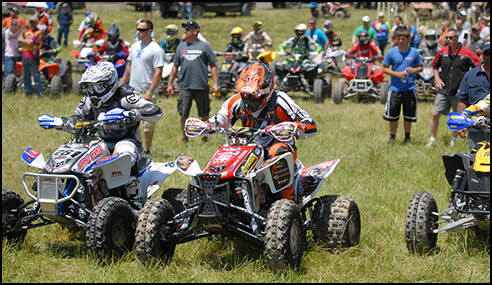 Many of the people I used to race with have sold their ATV’s and now we are lucky to have 30 TOTAL ATV’s at a local race. The WORCS series which is the national series for the west coast has also slowed down quite a bit and it’s a huge bummer for me. Most of the local motocross tracks in Arizona do not even allow ATV’s anymore or they allow them one day a week or one day a month. And don’t get me started on the legislation and “green” initiatives shutting down “public” riding areas. The point is, you east coast guys have it made and I am jealous!! Coming into this race I thought that I had realistic expectations.I entered the XC2 Pro Am class fully expecting to finish towards the back of the class but I figured I’d be faster than many of the A riders and all of the B riders. The 2 hour race time is a bit more than the 105 minute Pro/Pro Am race in the WORCS series which I had done once recently and finished well.I routinely race in 2-4 hour desert races or 12+ desert marathons in the pro class and I do well. Even though some of my friends said to go out there and show them how the west does it I knew better but even I was wrong about how hard this racing was going to be. I rode up the start line and I noticed these yellow spikes in the ground. Apparently the XC2 riders can go up early and lay claim to any starting spot they want. The XC2 class was full so I was left with 3 lane choices, all of which were horrible.I didn’t mind because I am no great holeshotter anyway. While waiting at the start I realized I hadn’t put a memory card in the GoPro camera I had borrowed from a friend.Way to go knucklehead. 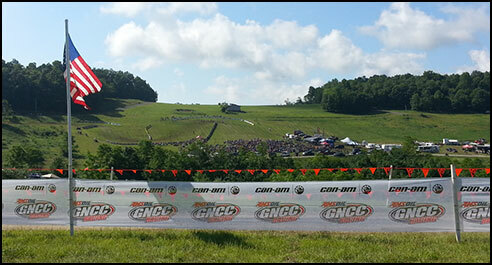 Race time finally came and it was surreal hearing the GNCC announcer yell out his famous call in person. The green flag dropped and I got an ok start thanks to the engine in McGill’s Honda 450R ATV and the awesome 24 volt electrical system. But I was on the far inside left side so when I got to the hairpin left turn I was met by a wall of ATV’s, 3 of which were tangled up and I was boxed in. So I waited for things to clear up, by the time we hit the woods I was in last or close to it. Racing in the trees was very different, there were spectators all over the place and racers ducking and diving in the trees.